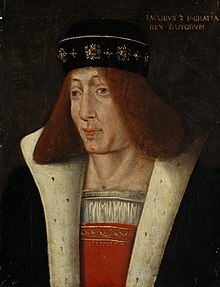 James II (16 October 1430 – 3 August 1460) was a member of the House of Stewart who reigned as King of Scotland from 1437 until his death. James was born in Holyrood Abbey. He was the son of King James I and Joan Beaufort. By his first birthday his twin and only brother, Alexander, who was also the older twin, had died, thus making James the heir apparent and given the title Duke of Rothesay. On 21 February 1437, James I was assassinated and the six-year-old James immediately succeeded him as James II. He was crowned in Holyrood Abbey by Abbot Patrick on 23 March 1437. In 1449, nineteen-year-old James married fifteen-year-old Mary of Guelders, daughter of the Duke of Gelderland. She bore him seven children, six of whom survived into adulthood. Subsequently, the relations between Flanders and Scotland improved. James's nickname, Fiery Face, referred to a conspicuous vermilion birthmark on his face which appears to have been deemed by contemporaries an outward sign of a fiery temper. James was a politic, and singularly successful king. He was popular with the commoners, with whom, like most of the Stewarts, he socialised often, in times of peace and war. His legislation has a markedly popular character. He does not appear to have inherited his father's taste for literature, which was "inherited" by at least two of his sisters; but the foundation of the University of Glasgow during his reign, by Bishop Turnbull, shows that he encouraged learning; and there are also traces of his endowments to St. Salvator's, the new college of Archbishop Kennedy at St Andrews. He possessed much of his father's restless energy. However, his murder of the Earl of Douglas leaves a stain on his reign. James I was assassinated on 21 February 1437. The Queen, although hurt, managed to get to her six-year-old son, who was now king. On 25 March 1437, the six-year-old was formally crowned King of Scots at Holyrood Abbey. The Parliament of Scotland revoked alienations of crown property and prohibited them, without the consent of the Estates, that is, until James II's eighteenth birthday. He lived along with his mother and five of his six sisters (Margaret had left for France, where she had married the future Louis XI of France) at Dunbar Castle until 1439. From 1437 to 1439 the King's first cousin Archibald Douglas, 5th Earl of Douglas, headed the government as lieutenant-general of the realm. After his death, and with a general lack of high-status earls in Scotland due to deaths, forfeiture or youth, political power became shared uneasily among William Crichton, 1st Lord Crichton, Lord Chancellor of Scotland (sometimes in co-operation with the Earl of Avondale), and Sir Alexander Livingston of Callendar, who had possession of the young king as the warden of the stronghold of Stirling Castle. Taking advantage of these events, Livingston placed Queen Joan and her new husband, Sir John Stewart, under "house arrest" at Stirling Castle on 3 August 1439. They were released on 4 September only by making a formal agreement to put James in the custody of the Livingstons, by giving up her dowry for his maintenance, and confessing that Livingston had acted through zeal for the king's safety. In 1440, in the King's name, an invitation is said to have been sent to the young, 16-year-old 6th Earl of Douglas and his younger brother, twelve-year-old David, to visit the king at Edinburgh Castle in November 1440. According to legend, they came, and were entertained at the royal table, where James, still a little boy, was charmed by them. However, they were treacherously hurried to their doom, which took place by beheading in the castle yard of Edinburgh on 24 November, with the 10-year-old king pleading for their lives. Three days later Malcolm Fleming of Cumbernauld, their chief adherent, shared the same fate. It is likely the king, being a small child, had nothing to do with this. This infamous incident took the name of "the Black Dinner". In 1449 James II reached adulthood, but he had to struggle to gain control of his kingdom. The Douglases, probably with his cooperation, used his coming of age as a way to throw the Livingstons out of the shared government, as the young king took revenge for the arrest of his mother (a means to remove her from political influence) that had taken place in 1439 and the assassination of his young Douglas cousins in which Livingston was complicit. Douglas and Crichton continued to dominate political power, and the king continued to struggle to throw off their rule. Between 1451 and 1455 he struggled to free himself from the power of the Douglases. Attempts to curb the Douglases' power took place in 1451, during the absence of William Douglas, 8th Earl of Douglas from Scotland, and culminated with the murder of Douglas at Stirling Castle on 22 February 1452. The main account of Douglas's murder comes from the Auchinleck Chronicle, a near contemporary but fragmentary source. According to its account, the king accused the Earl (probably with justification) of forging links with John Macdonald, 11th Earl of Ross (also Lord of the Isles), and Alexander Lindsay, 4th Earl of Crawford. This bond, if it existed, created a dangerous axis of power of independently-minded men, forming a major rival to royal authority. When Douglas refused to break the bond with Ross, James broke into a fit of temper and stabbed Douglas 26 times and threw his body out of a window. His court officials (many of whom would rise to great influence in later years, often in former Douglas lands) then joined in the bloodbath, one allegedly striking out the Earl's brain with an axe. This murder did not end the power of the Douglases, but rather created a state of intermittent civil war between 1452 and 1455. The main engagements were at Brodick, on the Isle of Arran; Inverkip in Renfrew; and the Battle of Arkinholm. James attempted to seize Douglas lands, but his opponents repeatedly forced him into humiliating climbdowns, whereby he returned the lands to James Douglas, 9th Earl of Douglas, and a brief and uneasy peace ensued. Military campaigns ended indecisively, and some have argued that James stood in serious danger of being overthrown, or of having to flee the country. But James's patronage of lands, titles and office to allies of the Douglases saw their erstwhile allies begin to change sides, most importantly the Earl of Crawford after the Battle of Brechin, and in May 1455 James struck a decisive blow against the Douglases, and they were finally defeated at the Battle of Arkinholm. In the months that followed, the Parliament of Scotland declared the extensive Douglas lands forfeit and permanently annexed them to the crown, along with many other lands, finances and castles. The Earl fled into a long English exile. James finally had the freedom to govern as he wished, and one can argue that his successors as Kings of Scots never faced such a powerful challenge to their authority again. Along with the forfeiture of the Albany Stewarts in the reign of James I, the destruction of the Black Douglases saw royal power in Scotland take a major step forward. Between 1455 and 1460 James II proved to be an active and interventionist king. Ambitious plans to take Orkney, Shetland and the Isle of Man nonetheless did not succeed. The king travelled the country and has been argued to have originated the practice of raising money by giving remissions for serious crimes. It has also been argued that some of the unpopular policies of James III originated in the late 1450s. In 1458 an Act of Parliament commanded the king to modify his behaviour, but one cannot say how his reign would have developed had he lived longer. James II is the first Scots monarch for whom a contemporary likeness has survived, in the form of a woodcut showing his birthmark on the face. Negotiations for a marriage to Mary of Guelders began in July 1447, when a Burgundian envoy came to Scotland, and were concluded by an embassy under Crichton the chancellor in September 1448. Philip settled sixty thousand crowns on his kinswoman, and her dower of ten thousand was secured on lands in Strathearn, Athole, Methven, and Linlithgow. A tournament took place before James at Stirling, on 25 February 1449, between James, master of Douglas, another James, brother to the Laird of Lochleven, and two knights of Burgundy, one of whom, Jacques de Lalain, was the most celebrated knight-errant of the time. The marriage was celebrated at Holyrood on 3 July 1449. A French chronicler, Mathieu d'Escouchy, gives a graphic account of the ceremony and the feasts which followed. Many Flemings in Mary's suite remained in Scotland, and the relations between Scotland and Flanders, already friendly under James I, consequently became closer. In Scotland the king's marriage led to his emancipation from tutelage, and to the downfall of the Livingstons. In the autumn Sir Alexander and other members of the family were arrested. At a parliament in Edinburgh on 19 January 1450, Alexander Livingston, a son of Sir Alexander, and Robert Livingston of Linlithgow were tried and executed on the Castle Hill. Sir Alexander and his kinsmen were confined in different and distant castles. A single member of the family escaped the general proscription—James, the eldest son of Sir Alexander, who, after arrest and escape to the highlands, was restored in 1454 to the office of chamberlain to which he had been appointed in the summer of 1449. James II died outside the walls of Roxburgh Castle when one of his bombards exploded. James II enthusiastically promoted modern artillery, which he used with some success against the Black Douglases. His ambitions to increase Scotland's standing saw him besiege Roxburgh Castle in 1460, one of the last Scottish castles still held by the English after the Wars of Independence. For this siege, James took a large number of cannons imported from Flanders. On 3 August, he was standing near one of these cannons, known as "the Lion", when it exploded and killed him. Robert Lindsay of Pitscottie stated in his history of James's reign that "as the King stood near a piece of artillery, his thigh bone was dug in two with a piece of misframed gun that brake in shooting, by which he was stricken to the ground and died hastily." The Scots carried on with the siege, led by George Douglas, 4th Earl of Angus, and the castle fell a few days later. Once the castle was captured James's widow, Mary of Guelders, ordered its destruction. James's son became king as James III and Mary acted as regent until her own death three years later. The Captain of the Guard (1862) by James Grant. The novel covers events from 1440 to 1452. Mostly covering the conflict of James II with the Earls of Douglas. Part of the action takes place far from Scotland, at the court of Arnold, Duke of Guelders, father-in-law to the King. Two Penniless Princesses (1891) by Charlotte Mary Yonge. James II is a secondary character. The main characters are his sisters Eleanor, Mary, and Joan "Jean". The novel covers their travels to foreign courts, including those of young Henry VI of England and René of Anjou. The Black Douglas (1899) by Samuel Rutherford Crockett and its sequel Maid Margaret (1905). The two novels cover events from 1439 to 1460, including most of the reign of James II. His conflict with the Earls of Douglas is prominently featured. Including James II stabbing William Douglas, 8th Earl of Douglas to death (1452) and James's own death due to a bursting cannon at the siege of Roxburgh (1460). Among the other historical figures depicted are William Douglas, 6th Earl of Douglas and his brother David (mostly their violent deaths in 1440), Margaret Douglas, Fair Maid of Galloway (protagonist of the second novel), Sir Alexander Livingston of Callendar, William Crichton, 1st Lord Crichton, Charles VII of France and his Dauphin (Louis XI and Agnès Sorel. The events take place primarily in Scotland, secondary in France. There is mention of the early phases of the Wars of the Roses (1455–1485) but English events are only "slightly touched". James II: Day of The Innocents (2014) by Rona Munro. A co-production between the National Theatre of Scotland, Edinburgh International Festival and the National Theatre of Great Britain. The James Plays – James I, James II and James III – are a trio of history plays by Rona Munro. Each play stands alone as a vision of a country tussling with its past and future. This play focuses on the early life of James II, the developing relationships with the Douglas family and the eventual death of Lord Douglas. Black Douglas by Nigel Tranter, covers events up to the killing of the 8th Earl of Douglas, is sympathetic to the Earl and unsympathetic to James II. Niccolò Rising by Dorothy Dunnett mentions his intrigues and wars as part of the international milieu of the time, especially as they impact Flanders, the scene of the novel. Appears as a background character in the children's fantasy novel In the Keep of Time by Margaret J. Anderson. His nickname and the birthmark which inspired it are both described, and one of the main characters witnesses the Battle of Roxburgh Castle and the explosion of "the Lion" that kills him. ^ Grants "Old and New Edinburgh"
^ a b c d Mackay 1892, p. 137. ^ Mackay 1892, p. 141. ^ Mackay 1892, p. 140. ^ Mackay 1892, pp. 140–41. ^ Mackay 1892, p. 136. ^ Tanner 2001, pp. 201, 204. ^ Tanner 2001, ch. 6. ^ Mahoney, Mike. "Scottish Monarchs - Kings and Queens of Scotland - James II". www.englishmonarchs.co.uk. Retrieved 11 October 2016. ^ "Project Gutenberg's Two Penniless Princesses, by Charlotte M. Yonge"
^ "Edinburgh International Festival 2014"
Mackay, A.J.G. (1892). "James II (1430–1460), king of Scotland" . In Lee, Sidney (ed.). Dictionary of National Biography. 29. London: Smith, Elder & Co.
Mike Salter (1985). Discovering Scottish Castles. Shire Publications Ltd. ISBN 0-85263-749-7. Tanner, Roland (2001). The Late Medieval Scottish Parliament: Politics and the Three Estates, 1424-1488. Tuckwell. ISBN 978-1-86232-174-8. 'The Auchinleck Chronicle', printed in McGladdery, James II, Appendix 2, pp 160–73. M. Brown, The Black Douglases (East Linton, 1998). C. McGladdery, James II (Edinburgh, 1990). R Tanner, The Late Medieval Scottish Parliament: Politics and the Three Estates, 1424-1488 (East Linton, 2001). This page is concerned with the holders of the forfeit title Earl of Douglas and the preceding feudal barons of Douglas, South Lanarkshire. The title was created in the Peerage of Scotland in 1358 for William Douglas, 1st Earl of Douglas, son of Sir Archibald Douglas, Guardian of Scotland. The Earldom was forfeited by James Douglas, 9th Earl of Douglas in 1455. Mary of Guelders was the queen consort of Scotland by marriage to King James II of Scotland. She served as regent of Scotland from 1460 to 1463. James Douglas, 7th Earl of Douglas, 1st Earl of Avondale, latterly known as James the Gross, and prior to his ennoblement as James of Balvenie, was a late mediaeval Scottish magnate. He was the second son of Archibald Douglas, 3rd Earl of Douglas and Joan Moray of Bothwell and Drumsargard, d. after 1408. Clan Crichton is a Lowland Scottish clan. Alexander of Islay or Alexander MacDonald was a medieval Scottish nobleman, who succeeded his father Domhnall of Islay as Lord of the Isles (1423–1449) and rose to the rank of Earl of Ross (1437–49). His lively career, especially before he attained the earldom of Ross, led Hugh MacDonald, the 17th century author of History of the MacDonalds, to commemorate him as "a man born to much trouble all his lifetime". Alexander allied himself with King James I of Scotland against the power of the Albany Stewarts in 1425 but, once the Albany Stewarts were out of the way, Alexander quickly found himself at odds with the new king. War with King James would initially prove Alexander's undoing, and would see the King's power in Scotland greatly increased, but at the Battle of Inverlochy Alexander's army prevailed against the forces of the King. Alexander died in 1449, having greatly extended his family's landed wealth and power. He was buried, not in the Isles of his ancestors, but at Fortrose Cathedral in his mainland Earldom of Ross. Alexander Seton, 1st Earl of Huntly, who adopted the family name of Gordon from about 1457, was a powerful 15th-century Scottish magnate. He was knighted in 1439/1440 and was Lord of Badenoch, Gordon, Strathbogie and Cluny. John de Winchester was a 15th-century English cleric who distinguished himself as an administrator and bishop in Scotland. Winchester was a student of canon law from 1418, graduating with a bachelorate in 1421. William Hay, 1st Earl of Erroll was a Scottish peer. His was the first Earl of Erroll and the second Lord Hay of Erroll.